This 1 bedroom with convertible den/2nd bedroom penthouse floor beachfront unit offers views unlike any other. The kitchen has been updated and tile throughout. 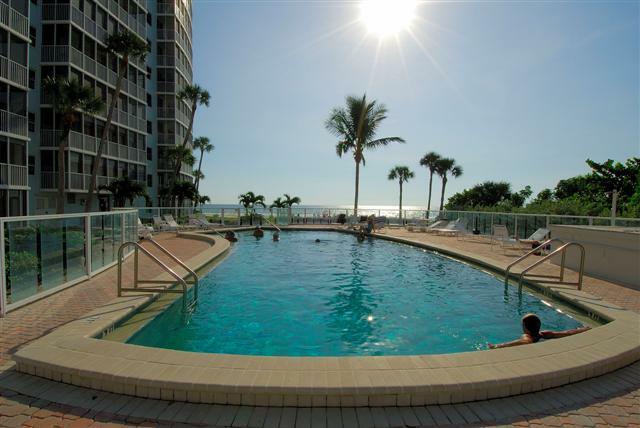 Offers washer/dryer in unit, curved balcony offering panoramic views north and south siesta beach, 3 T.V.s, 3 VCRs , DVD and wireless, highspeed internet, (Siesta 4 Rent is not responsible for tech support). Just at the foot of the building a pool awaits and beachchairs are provided by Crystal Sands. 1 covered parking, *NOTE 2nd bedroom will have a frosted glass and wood folding wall, to open the unit up for more living or private for a bedroom. Unit offers 1 King, 1 Queen murphy bed in den & 2 twin sleeper sofas in living room. Sleeps 6. 2 week min.